The carnage in France's Mediterranean resort shows, yet again, a profound failure to understand ISIS and groups like them. Military solutions are not the answer -- we need new policy on global security. A police officer watches people gathering around a floral tribute for the victims killed during a deadly attack, on the famed Boulevard des Anglais in Nice, southern France, July 17, 2016. Laurent Cipriani /Press Association. All rights reserved.Another attack hit French soil last week, confirming that the country is at present Europe's number-one terrorism hotspot. At around 10.30pm, a large white truck was driven by a young man for two kilometres along the packed Promenade des Anglais in the French Riviera city of Nice, crushing everyone in its way. The result was a massacre in which at last 84 people, including several children, died. They had gathered to watch the fireworks display on France's national day. Hundreds of people were also injured, some of them very seriously. The driver, Mohamed Lahouaiej-Bouhlel, a 31-year-old Tunisian resident in Nice, was shot dead inside the vehicle. Bouhlel was known to the police for petty crimes, but not to the intelligence services. The circumstances of this carnage, in a popular resort near the peak of the holiday season, carry high symbolism. For Nice was commemorating the anniversary of the storming of the Bastille on 14 July 1789, the foundational event of the French revolution. The day also marks the Fȇte de la Fédération in 1790, celebrating the end of tyrannical rule and the beginning of republican monarchy. The massacre was thus perpetrated at a moment when the unity of the French nation, and the three tenets of its republican motto --liberté, égalité, fraternité -- are of special significance. There is still a lack of understanding of why these actions continue and of what al-Qaida, ISIS and other Islamist paramilitary groups really are. ISIS claimed responsibility for the massacre in Nice, saying a 'soldier' carried out the attack. In the last few weeks the group has repeatedly called for such attacks. Moreover, ISIS media channels soon began to release celebratory statements and other material about what happened in Nice. The same hashtags used to post updates on Twitter, #Pray for Nice and #Nice06, have been used by ISIS supporters to flood Twitter with pro-ISIS propaganda. For example, the following notice was posted on the al-minbar forum: “This is the beginning of the attack to take holy revenge for the killing of Abu Omar Shishani, may Allah accept him”. 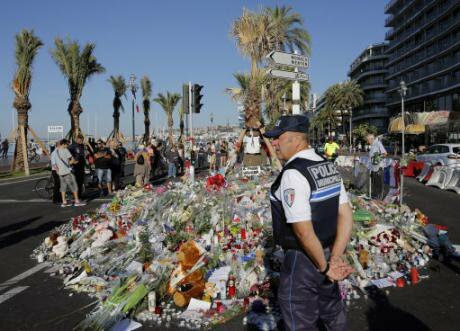 Nice is the latest of many massacres that, since the 11 September 2001 attacks in the United States, have contributed to the global state of insecurity being experienced worldwide. Yet there is still a lack of understanding of why these actions continue and of what al-Qaida, ISIS and other Islamist paramilitary groups really are. To remedy that, there needs to be profound and critical reflection on the failure to understand these phenomena. One of the biggest obstacles to understanding is to be found in the fact that both experts and laypeople tend to view groups like ISIS as an existential threat in its own right. However, as Paul Rogers suggests in many of his openDemocracy columns, such groups should rather be seen as symptoms of a much bigger and more complex situation characterised by irregular warfare. In this light, al-Qaida, ISIS and similar paramilitary groups reflect a wider global insecurity whose real drivers, in Rogers's words, are: “deepening socio-economic divisions, which lead to the relative marginalisation of most people across the world, and the prospect of profound and lasting environmental constraints, caused by climate change. ISIS, in short, should be seen as a warning of what could be to come, not as a fundamental trend in its own right”. Rogers emphasises that “ISIS is an example of a revolt from the margins”. That is why there is not and cannot be a military solution to terrorism. Today, it is now widely recognised in both academic and policy circles that the so-called "war on terror" has brought far more harm than good. But hard military approaches to counter-terrorism continue to be prevalent worldwide, while soft-power approaches remain the exception rather than the rule. To be fair, European and American policymakers have shown a lot of interest in counter-radicalisation policies aimed at preventing violent extremism among targeted (mainly Muslim) groups. But most of these policies have been badly designed and implemented, and as such they undermined the trust of Muslim communities. By making the latter feel stigmatised, these policies had the opposite effect to those intended. Here, the problem resides in the way ‘radicalisation’ is understood. More effort should be made to understand the wider picture—or to use a medical metaphor, the social disease of which the now frequent attacks are a symptom. Different scholars and analysts have given very diverse explanations of the genesis of terrorist acts and the drivers behind them. All probably have elements of truth, but none fully grasps which social and psychological paths push individuals to take action in the name of a violent extremist organisation. After events such as Nice, the need for a profound and critical rethinking of the current counter-terrorism approach is more pressing than ever. A good start would be for policymakers and academics to admit that the current global security situation is extremely complex, and that there are no quick fixes. It should also be made explicit once for all that a kinetic approach to counter-terrorism is not and will not be the solution. Instead, more effort should be made to understand the wider picture—or to use a medical metaphor, the social disease of which the now frequent attacks are a symptom. On that foundation, the real challenge is to devise effective and sustainable strategies able to reverse the hard military approach that has dominated counter-terrorism up to now.